â€œAnna and Frederick Douglassâ€™s Parking (Lots of Love)â€ invites festival visitors to help create an art installation that will be displayed in Rochester to honor the coupleâ€™s lives. Visitors to this year’s Imagine RIT: Innovation and Creativity Festival on the Rochester Institute of Technology campus on April 28 will get the chance to write to one of Rochester’s most famous residents: Frederick Douglass and his first wife, Anna. The exhibit, “Anna and Frederick Douglass’s Parking (Lots of Love),” invites festival visitors to help create an art installation that will be displayed in Rochester to honor the couple’s lives. Visitors will be asked to imprint their own words about peace, love, justice, equality and civil rights. This year is the 200th anniversary of Frederick Douglass’s birth. The installation is planned to be erected in September at the site of Anna and Frederick’s home from 1848 to 1951, which is now the site of a parking lot at 297 Alexander St., next to the Lanai restaurant. “We’re looking for comments from the community about how the Douglass legacy has impacted their lives, and we ask visitors to express their hopes for equality and justice in Rochester and the USA, and how they envision the social justice that was done here,” said Hinda Mandell, associate professor in the School of Communication in RIT’s College of Liberal Arts. Mandell said the project is important to commemorate unmarked locations in Rochester that have historical significance. “There is no visual representation, no sculpture of Anna Douglass in the public that I’m aware of in Rochester,” she said. She said it’s also important to publicly recognize Anna’s contributions to her husband. 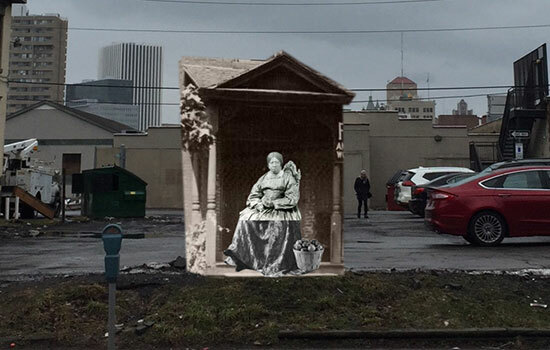 “I really see this art installation as a way to revisit history and let the public learn about this remarkable woman who was behind the scenes,” Mandell said. During the Imagine RIT festival, the exhibit will be set up on the first floor of the Wallace Library. Phrases in all languages are welcomed, including a visual representation of American Sign Language. A sign language interpreter will be stationed at the exhibit from 11 a.m. to noon. A 3D printer will print selections from the public submissions on hexagon panels for a quilt which will be covering Anna Douglass’s lap in the installation, Mandell said. A portion of the life-sized, digitally-enhanced installation may include conductive paint, QR codes and a laser, said Shawn Dunwoody, a Rochester designer and self-described “artivist” who will be creating the installation. “We really want to incorporate community involvement and engagement,” Dunwoody said. The sculpture itself will use traditional materials and look like a façade of their home. But it plans to be interactive. When you touch Anna’s hand, for example, it may trigger other elements. Cameras may be hooked up to her eyes so other things may happen when someone approaches it. Several RIT students in various colleges, including Associate Professor Kelly Martin’s visual communications class, have also been involved in planning the installation. The project is cosponsored by the College of Liberal Arts, its Department of History, Digital Humanities and Social Sciences, School of Communication, William A. Kern Professorship in Communications, School of Individualized Study, the National Technical Institute for the Deaf, the College of Imaging Arts and Sciences, the Division of Diversity and Inclusion and MAGIC Spell Studios.